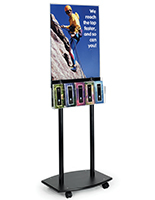 This black poster stand with business card rack, which offers dual advertising through graphics and a 10 pocket attachment, is a perfect display for a high-traffic office or store. 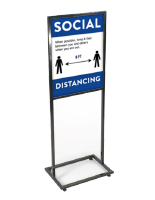 The clear acrylic sign holder is double sided for effective viewing, while the MDF floor standing base is durable enough for the busiest of lobbies and retail environments. 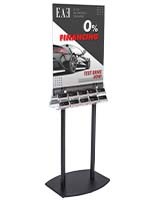 Designed to frame 22” x 28” graphics, advertisements are easy to replace and keep up to date with the side loading insert on the versatile poster stand. 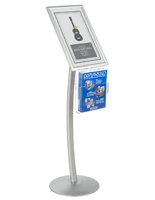 While the sign holder has a vertical layout for optimal display, the included attachment is angled so your contact information is visible from every viewpoint. 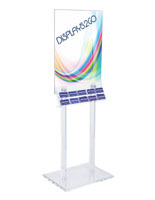 Each acrylic pocket has an open top for you to quickly restock and your potential customers to easily access. 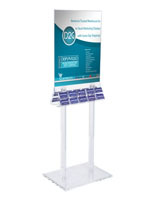 For a clear display that effectively advertises your company and distributes your information, look no further than this poster stand! I really love this item. It assembled easily. 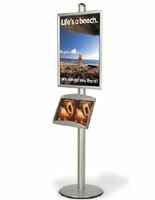 The trickiest part is sliding posters in without removing part of it but I was able to do it. It very sharp & sturdy. 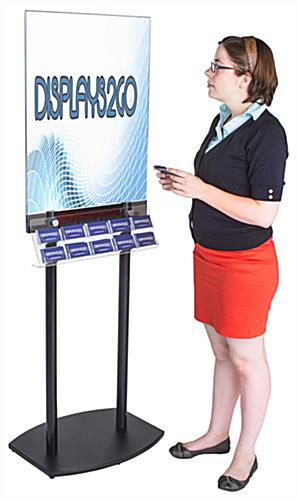 Really looks good in our lobby. 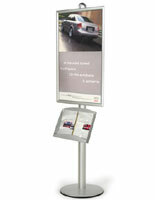 We love that you love your poster holder, Todd! Thanks for taking the time to review.